Plans to devolve powers to Norfolk and Suffolk with a mayor have been scrapped by the government in their present form. 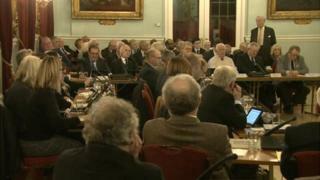 It follows Thursday night's vote by King's Lynn and West Norfolk Council to overwhelmingly reject the deal. The devolution plans were set to bring to the East £750m over 30 years for infrastructure and £130m for housing. The new set-up would have given the new authority road and housing powers from central government. A meeting of Norfolk County Council due to take place on Monday to consider devolution has been cancelled. I am told the Local Government Secretary Sajid Javid has decided that the deal can't go ahead in its present form. As a result Norfolk County Council has cancelled Monday's meeting when councillors would have voted on the plan. But Suffolk is being told to continue with its meetings next week as ministers feel Suffolk devolution on its own may work. Norfolk County Council leader Cliff Jordan said: "The Secretary of State for Communities and Local Government has been clear throughout the devolution process that for a combined authority to be set up all participating councils would need to consent to his draft order. As a result of King's Lynn and West Norfolk's decision, we understand the Secretary of State will be writing to the Norfolk and Suffolk authorities to take the current devolution deal off the table. "I will be making clear to the Secretary of State that Norfolk County Council continues to be willing to discuss alternative proposals." Jennie Jenkins, chair of Suffolk County Council's public sector leaders group, said she was disappointed by King's Lynn's vote. "We will be seeking to explore the potential for a Suffolk-based devolution deal and to investigate options for establishing interim governance arrangements for any such alternative deal," she said.